Today we had the privilege of visiting two Cavaillé-Coll organs famous not only in Paris but around the world! After eating a scrumptious breakfast of homecooked scrambled eggs and fresh croissants from the boulangerie down the street, we were off to the Church of Saint-Antoine-des-Quinze-Vingt. The organist there, Eric Lebrun, kindly met us and showed us the organ. The original 1894 Cavaillé-Coll instrument belonged to the French Baron Espée who used it to play his favorite Wagner operas, but it was moved to St. Antoine and expanded by organ builder Merklin. For most of us, this was our first time experiencing the magic of a Cavaillé-Coll organ in person, and we each got to play a piece to try it out. Noel plays Franck’s Prelude, Fugue, and Variation on the Cavaillé-Coll organ of St. Antoine. We parted ways with Saint Antoine and found a niche in the back of a Parisian cafe to eat a much desired lunch. With fully nourished tummies, we headed out with intentions of going to the Musée d’Orsay but ended up enjoying a leisurely walk along the Seine instead. A highlight of our walk, other than the beautiful Parisian scenery, was a stop on the Pont des Arts, otherwise known as the “bridge with the locks.” There was a debate about whether or not the Organ Society should contribute a lock, but the overall consensus was undecided so we did not. We continued our walk along the Seine in the direction of the Latin Quarter on the way to St. Sulpice, stopping for coffee on the way. As we approached St. Sulpice, we saw its bell tower looming in the distance and became excited for our upcoming venture inside. One step inside the sanctuary and we were filled with awe of the beauty and magnificence of the space. Titular organist Daniel Roth met us and brought us all up to the organ gallery. The original organ was a Clicquot instrument, and Cavaillé-Coll enlarged it to its present-day grandeur in 1862. We each played a piece and were inspired by the splendor of the organ. The famous Cavaillé-Coll organ of Saint Sulpice. Meeting the esteemed Daniel Roth! Roth teaches us about the history of the organ. Laura plays Duruflé on the organ of Saint Sulpice. 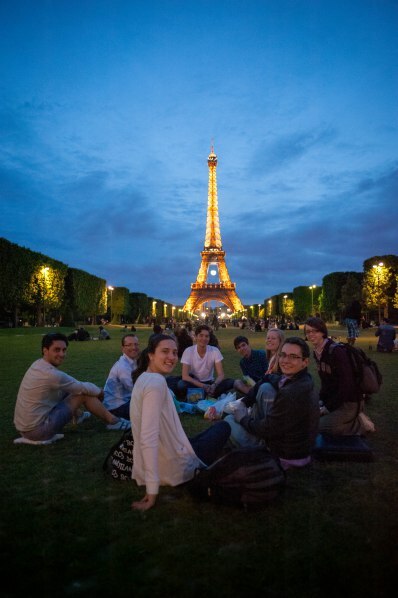 Inspired by our experience on the grand St. Sulpice organ, we decided to have a dinner picnic by the Eiffel Tower! We picked up some prosciutto, brie, baguettes, and a vegetable platter from the supermarket and enjoyed the backdrop of the famous landmark as we ate our French meal. Enjoying our lovely picnic with a view after a fulfilling day.